The Kalais is a huge 100m long ship that was scuttled after a dispute of paying mooring fees. The Kalais, sometimes written as Calais, lies just outside Las Palmas, this is the wreck of a hundred-meter long cargo vessel, which was scuttled in the 1980's after the owners refused to pay mooring fees. It sits upright on the sea bed just outside the new harbor works and is in an excellent state of preservation, and still boasts many artifacts and equipment that would long ago have disappeared in British waters. 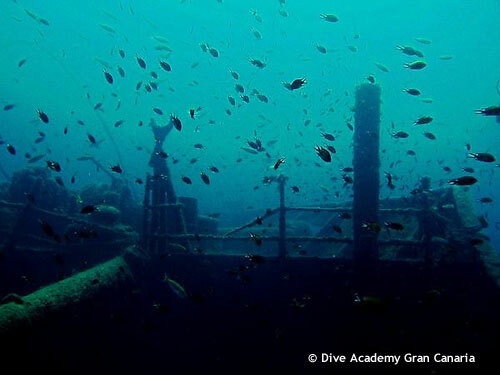 It is now the home to very big schools of barracudas and Damselfish swimming around the king post which can be followed from 14 meters to the deck at 27 meters. Here you can enter the hold, which still contains much of its cargo of cement bags. At the stern the walkways provide a lovely swim-through and you can find both the bath and the cooker. Sea-life includes glasseyes, lobsters, morays, wrasse, damselfish, parrotfish, bream and other common species, and Angel-Sharks have been seen prowling nearby on the sand.